SPJ Colorado professional chapter is accepting applications from Colorado high school and college students for 2019 scholarships. Check out and download the requirements on our scholarships page, and get your resume, clips and essay together. Applications are due Jan. 31, 2019, but don’t procrastinate! The award was one of four special honors announced at the chapter’s annual awards ceremony at the Denver Press Club. The contest awards went to journalists in Colorado, New Mexico, Utah and Wyoming. Philipps won the 2014 Pulitzer on April 14 for his series “Other Than Honorable” that examined how soldiers injured during war were being discharged with no benefits. The SPJ award was for the same stories which were published in The Gazette in May 2013. “Dave Philipps would be the first to tell you there are many others deserving of this award. But his work exemplifies the best of what we all endeavor to do,” said Jim Anderson , news editor Denver’s AP bureau and Colorado Pro board member. 7News received the SPJ First Amendment Award for the Denver TV station’s ongoing series titled “Contrary to the Public Interest” about problems with Colorado’s open records laws. “It was an ambitious, and important, project. During months of investigations, Channel 7 found that — while Colorado’s open records laws are supposed to keep government officials accountable — getting documents can mean paying huge fees or becoming tangled in expensive legal battles,” said Cara DeGette, board member. SPJ’s Keeper of the Flame Award, which recognizes a distinguished career in journalism, went to Westword editor Patty Calhoun. 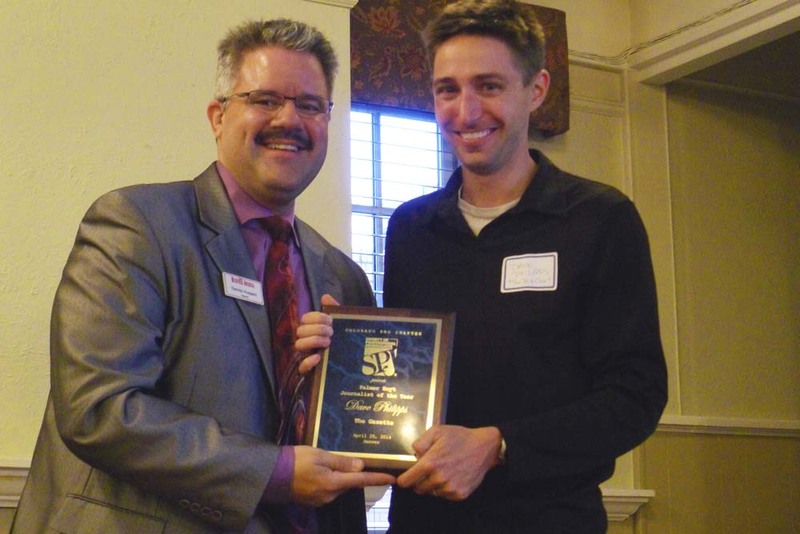 Colorado Mesa University assistant professor Eric Sandstrom received the SPJ Journalism Educator of the Year Award. Sandstrom was cited for his contributions to the school’s journalism program as faculty adviser to the campus newspaper and for his work in the classroom. He also was instrumental in establishing a student SPJ chapter in 2012 at the Grand Junction university. Prior to joining CMU in 2007, Sandstrom worked at newspapers in Ohio, Illinois and Nebraska and taught at Kent State University and Cleveland State University. Top of Rockies set to ROCK DPC, Scholarship winners and more …. It’s April and Colorado Pro is hoping your Spring has sprung. We are deep into planning for our biggest event of the year, the Top of the Rockies Awards Reception Friday April 25 at the Denver Press Club. More details below, but we hope you all can make it. We’ve awarded our 2014 scholarships and there’s also a cool May program coming up. The Top of the Rockies Awards night, as we said, is next week! The fun starts at 5:30 p.m. on Friday, April 25, at the Denver Press Club, 1330 Glenarm, Denver. After socializing, networking, beverages and light appetizers, we’ll start the awards presentation at 7 p.m. We’ve got a NEW format for announcing awards that doesn’t involve a lot of name reading (don’t worry, you all will still get cool recognition in front of your peers). With a record number of entries this year, we’re expecting a lot of attendees to celebrate recognition for a lot of hard work and fantastic journalism in 2013. Entry is free to winners and we’ll ask for a small donation from others to help defray costs. Light appetizers will be provided with a cash bar. Our keynote speaker is Patty Calhoun, editor of Westword. Don’t forget to RSVP on our Facebook page, so we know how much food to make. Congratulations to the winners of this year’s scholarships by SPJ’s Colorado Pro chapter. Scholarships are awarded on the basis of merit, need and desire to be a journalist. We had more applicants this year than we’ve had in a while, so thanks all you students for your interest. And because of the elevated number of applicants, the board awarded more money than ever: $7,500! * Kiki Turner of the University of Colorado at Boulder, $1,500. * Kara Mason of Colorado State University-Pueblo, $1,500. * Scott Fromberg of Colorado State University, $1,500. * Allison Dyer Bluemel of Colorado State University, $1,000. * Cali Rastrelli of Colorado State University, $500. * Hunter Goddard of Colorado State University, $500. * Sasha Klepitskaya of the University of Colorado at Boulder, $1,000. We wish all the winners much luck in your continued journalistic endeavors. Colorado will again play a prominent national role in the November elections and where there’s interest, there’s money – a lot of it – with much of it pouring in from outside the state. Journalism and Women Symposium and the Colorado Pro Chapter of the Society of Professional Journalists will co-sponsor a program on elections and campaign finances on Thursday, May 1, at the Denver Press Club, 1330 Glenarm Place. The 6:30 p.m. event is free and open to the public. Join Nancy Waltzman of the Sunlight Foundation, who will show you tools to follow the federal money that flows into the state, and Sandra Fish, an independent journalist, who will offer tips on tracking money at the state level. The Sunlight Foundation is a nonpartisan nonprofit founded in 2006 that uses the power of the Internet to catalyze greater government openness and transparency. From the face off between U.S. Rep. Mike Coffman and former Colorado House Speaker Andrew Romanoff to the competitive race between U.S. Sen Mark Udall and U.S. Rep. Cory Gardner, to the battle over control of the Colorado Senate, there is much to watchdog. Fortunately, there are resources to help. At the May 1 program, find out how to use Sunlight’s suite of tools and apps to track the latest campaign finance reports, ad spending, fundraisers and more. Learn to navigate the Secretary of State’s campaign finance system and where else to go for Colorado information (think TV ad contracts, with caveats and cautions on what to look for and what to look out for. The Society of Professional Journalists Colorado Pro chapter is pleased to announce our Helen Verba scholarship winners for 2013: Alison Noon of the University of Colorado at Boulder and Collene Lewis of Metro State University. Alison Noon will graduate from the University of Colorado Boulder with a double degree in Political Science and Journalism in May 2014. After graduation she will pursue a career reporting in some aspect perhaps yet to be discovered, though she most enjoys writing and editing text stories. Raised in both Portland, Ore., and Fort Morgan, Colo., Alison is not a fan of any particular sports team apart from CU men’s basketball. She looks forward to a reporting internship at The Colorado Springs Gazette in the summer of 2013 and stepping into the position of managing editor at the CU Independent in the fall. Collene Lewis is a junior at MSU Denver, but a first-year journalism student. While studying journalism, Lewis has held positions at The Metropolitan of features reporter, news reporter and assistant to the news editor. She said winning the 2013 Helen Verba Award is an honor, as it will lift the financial despair that plagues her as a college student, encourage her to complete school and pursue a magazine-related career. Both of these students are talented and our judges had no problem separating them from the pool of applicants. Our congratulations to them and wishes for successful completion of their undergraduate studies and great careers in journalism. Eligible applicants include freshmen, sophomores, juniors or seniors from Colorado who are studying print journalism at any U.S. college or university. Fresh off the success of the Region 9 conference held in Denver in April, your SPJ Colorado Pro chapter board has been hard at work making sure our finances stay secure and well-invested, the board is well represented and we’re keeping up with our reporting requirements to SPJ national. First off, we’re proud to announce our 2012 scholarship recipients: Lauren Archuletta, CU-Boulder, 2012 Helen Verba scholar Ye Ming, CSU-Pueblo, 2012 Helen Verba scholar; Christie Sounart, CU-Boulder, 2012 Helen Verba scholar; Brittany M. Moore, CU-Boulder, 2012 Sheldon Peterson scholar. Each was awarded $1,800 to help offset college tuition costs. Members: thanks for your support all year – helping young journalists is one of the most important things we do. At our May meeting, the board approved an investment policy to guide our continued financial stability. Many thanks to Treasurer Christine McManus VonGunden, President Cara DeGette and all the help and guidance we got from David Milstead. Board members appointed Gil Asakawa to fill a vacant board seat. He will stand for election this summer as our diversity chair. Asakawa is a Denver media veteran who began his career in1980 as a reporter and music editor for the alt-weekly Westword, and also served as entertainment editor for the Colorado Springs Gazette. In 1996 he took his first online position running AOL’s Digital City Denver, an early “hyperlocal” effort, and he’s never looked back. He has managed The Denver Post’s website, and worked at the management level for MediaNews Group, Examiner.com and Advance Newspapers. He is currently Manager of Student Media for the University of Colorado. President DeGette has filed out annual report to national, outlining all the educational and fun programs we had this year. The report shows we complied with all requirements to remain a chapter in good standing. We’d like to welcome the Mesa University Chapter of SPJ, which the national board approved in April. Many thanks to Membership Chairman Ed Otte for his continued outreach efforts and visit to the Western Slope newsrooms and campus. That’s it for this month. As always, please email us programming suggestions or if you have interest in serving on the board – elections are coming this summer.